And what better time than Christmas to reach out to others with this message of hope, as people the world over come together to celebrate. That’s why Christian Concern is excited to bring you a collection of videos and podcasts that help to refocus on the true meaning of Christmas. 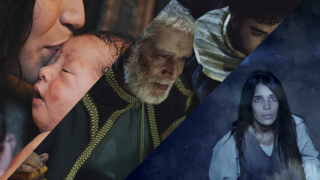 Whether you are looking for a short video to share with a non-Christian friend, or want a new Christmas devotional for your mornings, these resources get back to the heart of the Christmas message and challenge us once again to look to the God who gave up everything to come down to earth. Why not give them a watch with friends or family as you prepare for Christmas? Or share them with your non-Christian friends and reach out to them with the message of Jesus Christ? In this short video, Evangelical Alliance asks what Christmas should mean for each us and why it should matter. Phil Knox reflects on the heart of the Christmas story with a few familiar lines from some Christmas classics. YouVersion, the biggest Bible app, has helpfully partnered up with LumoProject.com to bring these beautiful real-life videos of the gospels. These re-enacted versions of scripture help to bring the words of Bible to life and put you right into the Christmas story. “God walking on earth is more important than man walking on the moon” – or so said Colonel James Irwin, the 8th man on the moon. This powerful new video from Speak Life explores the cost and the danger of reaching the heavens and putting man on the moon. But ultimately, the cost and the danger of Heaven coming down to Earth was so much greater. For a longer retelling of the Christmas story, especially for those who are more unfamiliar with its true roots and meaning, Canon J John preaches on the true meaning of Christmas at Hillsong, London. Glen Scrivener’s series ‘Reading Between the Lines’ is a set of devotionals for every day of the year. However, his first nine are all based around the Christmas story and are well worth watching during Advent. In his last Christmas video, he talks through the themes presented in the visit by the wise men, and asks, what can you give to the person who has everything? Over the years, Christmas has become a consumer’s dream – or possibly nightmare. This clever and moving video from Co-Mission Churches offers an alternative kind of advert, telling the story of an old, battered teddy bear who longs to be accepted but is too afraid of his flaws being exposed. What happens when he is discovered? The Bible Project brings the first two chapters of Luke’s gospel to life in this fun animated telling of the Christmas story. John Piper reads his poem, ‘The Innkeeper’, which tells the imagined story of the innkeeper who lived the reality of King Herod’s instruction to kill all the baby boys under 2 years of age. Only an encounter with Jesus can bring true healing. Please forgive us for sneaking this one into our list – it’s actually a podcast, not a video. But it’s well worth your time. Join Professor Jonathan Burnside in a series of short talks giving insights from the Bible and from ancient history to show how the nativity story is relevant to politics. Jesus overthrew the political powers of his day, but he did it in a way that nobody was expecting. His story will forever change the way we engage not only in political life, but all areas of life. Professor Burnside explains what it looks like to “give our primary allegiance to heaven, not to Rome”. Professor Burnside explores the concept that “the path to greatness is the path to self-denial, servanthood and humility”. Professor Burnside discusses what it means for these “cultural kings” to bow down before King Jesus. Professor Burnside investigates how the promise that the government would be on Jesus’ shoulders empowers us in our own political life and has the power to turn all our expectations upside down. At Christian Concern, we’re so encouraged by the boldness and creativity of so many churches and Christian ministries making the most of Advent and Christmas. Let’s make the most of these resources, and this season, to honour Jesus, the light of the world.